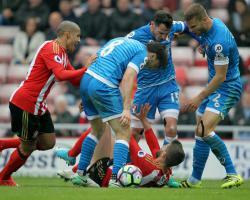 The allegation surrounds an incident which happened 76 minutes into the Cherries' 1-0 win on Wearside following Fabio Borini's challenge on Lewis Cook. An FA statement said: "Both Sunderland and Bournemouth have been charged following their game on Saturday. They have until 6pm on 5 May 2017 to respond to the charge." Players from both sides reacted and referee Stuart Attwell and his assistants took some time to restore order before Borini and Bournemouth midfielder Harry Arter were booked in the aftermath. The visitors eventually won the game 1-0 through Josh King's 88th-minute strike, which condemned the hosts to relegation with four games still to play.